It is virtually impossible to overstate the dire consequences resulting from the severity of the declines recently experienced in almost all asset classes—from both a technical and fundamental viewpoint. From a fundamental perspective US consumers had come to rely on borrowing against growing asset prices to sustain their lifestyles. Most of today's globally-interconnected economy was based upon growth in the US consumption. This game has ended badly. Asset dependency will eventually be replaced by living off of income and savings, but not after we escape from this disastrous period. As unemployment rises income generation will become increasingly difficult, and we cannot begin to save until our mountainous debt is paid off. For most of us, this is the equivalent of the world being turned upside down on our heads. From a technical perspective, the picture is equally as dire. 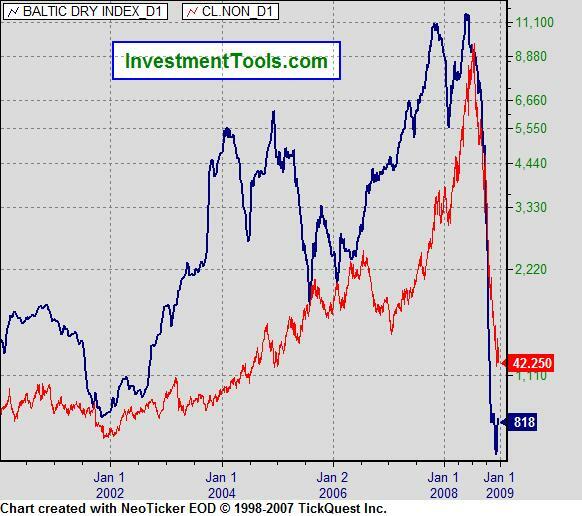 Take a look at the chart below of the Baltic Dry Index and of crude oil. Collapses of this magnitude do not recover until after elongated periods of basing and repair – eye-catching, sharp, short-term bounces, yes; runs back to new highs, no. This is true for most all commodities with the exception of precious metals. It now appears that the end of decade “flameout rally” I had been predicting in previous commentary ( http://www.greenfaucet.com/commodities/.. and http://www.greenfaucet.com/the-market/..) is now in the rear view mirror. The rally did not extend as the equity rally had the end of last decade because the gains contributed to a crashing economy and the deleveraging process disproportionately punished them. Unlike gains in equity prices which tend to extend economic gains due to the wealth effect, gains in commodities prices tend to harm economic growth in a stock-market-dependent economy. Retracement levels (corrections within the bull runs) are common – typically 38%, 50% and sometimes 62%. Drops exceeding 50% draw a major red flag and those greater than 62% are “uninvestable” in my playbook. Having said that, they are not untradeable. In fact, you can register spectacular gains if you are nimble enough to take advantage of oversold rallies before the next downtrend. The point I wish to emphasize here, however, is that the secular uptrend that has been in place for commodities, real estate and world equities has ended. Moreover, anything that has not yet crashed most likely will. The US stock market indices are on the cusp of a major collapse. World sovereign debt is in the final blow-off phase of their bull runs and they will be the last to fall. And just before they do, the real mad scramble to own gold will begin. 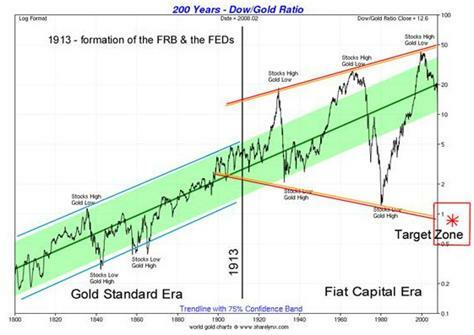 We are now beginning to see gains in gold and treasuries, a rare though not unprecedented occurrence. Equally rare are drops of 48% in the DJIA and S&P 500. Market historians and technical analysts look to 1929, 1938, and 1974 for comparisons. 1929 marked the beginning of a deflationary depression. The market dropped in the late fall in bounced almost 50% into the spring of 1930 before dropping another 90% into 1932. 1938 was not quite as perilous as stocks bounced and stabilized in 1939 and then consolidated and based until 1942, ending the bear that began in 1929. In the 1974-1975 period stocks dropped 48% and then actually pivoted higher to challenge the 1968-high by the end of the decade. I am quick to dismiss drawing a comparison to the 74-75 period because, though treasury yields slipped lower, they did not go to zero, and there was minimal debt and deleveraging by comparison. 2008 and 1938 are similar in that both saw drops of similar magnitude after having experienced cyclical bull runs which followed a market crash 8 years prior (2000 and 1929). Where this comparison falls short is that we will not have experienced a 90% collapse along the way. I believe that such a collapse is necessary and inevitable. We are therefore likely to have our 90% correction in 2009 rather than in 1930-32 period. The good news is that we are likely in the 1938-period in terms of overall duration of the bear market which means that it will likely end in four years. The chart below is helpful in illustrating the periods of comparison. The chart is from a Wall Street Journal article written today by E.S. Browning titled “Stock Investors Lose Faith, Pull Out Record Amounts”. One of the great pearls of wisdom Browning shares in the article serves as a precursor to the stampede out of the market we have yet to experience: "'For many investors, this has been a glimpse into the abyss,' says Terrance Odean, a finance professor at the University of California, Berkeley, who has studied the behavior of individual investors. ‘They have been told that if you save regularly for retirement and buy and hold, you will be fine. Now, people see a possibility that this will not be the case.'" The hopeless optimists will once again wrongly argue that the negative sentiment is a bullish contrarian indicator and that now is time to buy…it's always time to buy for them. The problem is that what investment advisors, chartered financial analysts, and economists are taught does not apply in the current environment. If we have learned anything from our current predicament it is that we cannot rely on the ‘experts for guidance. No, history is our best teacher. Just as policy-makers knew that they had the tools to prevent the depression, similar expectations hold for the “dream-team” of economists Obama has assembled to form his economic policies. The current period will be more about preserving wealth than creating it. Your financial plan will require more of an emphasis on paying off debt, saving, and slashing your budget than it will on investing and designing a well-crafted diversified portfolio. Most financial advisors are going to need to be re-trained. Unfortunately for them , many of the firms they are working for will not exist in a few years. 27 Feb 09, 12:06 How far will Dow Jones average fall? 27 Feb 09, 19:48 How Far Dow Down? Try 1,500 before end of 2010. That's what at least one respected historian has said by studying comparisons with the Great Depression charts. 19 Mar 09, 06:37 ??? 1500 to 2000 on the Dow is very probable by the end of next year, 2010. The crux of the matter is, in 1930 we were not cavemen. The US Government and Financial gurus of the time tried EVERYTHING to avoid the inevitable collapse. That´s nothing compared to what we are in right now, simply because we have so much more to lose than those simpler times...but out of this doom comes great success if you are 1 in a few hundred million. I´ve been calling for the figurative death of greedy paper pushers for quite some time. 03 Jan 11, 03:03 Now what? Ok, so I sold all my stocks as the DOW was around 7000, and am now ready to buy back in here in early 2011, with the DOW around 2000. I must have saved a bundle by not holding on to stocks! Thank you, respected historian, for the sound advice.